Trends and crazes come and go with the turn of the season, yet it’s unlikely that the kitchens focussing on small sharing plates that arrive at the table as and when they are ready will be vanishing any time soon. And though this rapid increase in popularity has managed to divide opinion over the past year or so; it’s clear that sharing plates venues are the in thing for 2016. They are the the Pokémon Go, the Facebook politicians, and the Snapchat dog filter of the restaurant world. I, for one, am a fan of this sharing culture. While some things are far too good to share – others prove that a problem shared really can be a problem halved, as demonstrated with some of the food at 100 Islington. 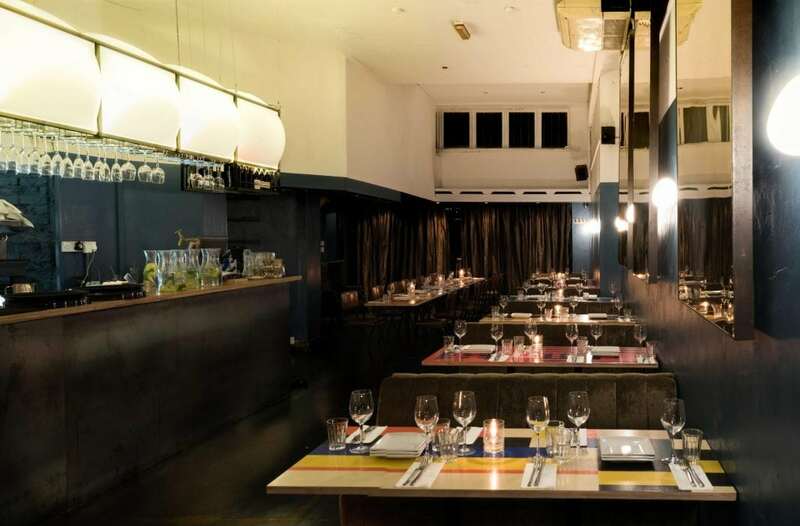 Opened earlier in the summer, taking over a site in the middle of Upper Street, equidistant between Highbury & Islington and Angel tube stations, 100 Islington is the second venture from the team behind Shoreditch’s 100 Hoxton. Inside, the vast space is split into two – with a front bar area and a darker area towards the back of the room, bedecked with modern art, communal tables and a surprisingly buzzy atmosphere for an early Tuesday dinner. It’s the sort of place that’s ideal to meet for a fun after-work drink, with an extensive cocktail list widening the appeal, offering a number of classics alongside inventive contemporary twists. As for the food on offer, Executive Chef Francis Puyat – formerly of Yotam Ottolenghi’s widely acclaimed NOPI – has created a long menu of small dishes, taking much influence from Asia, the Mediterranean and the Middle-East. When done properly, such an assortment can be pulled off with extreme finesse, yet it’s incredibly easy for dishes to completely lose their identity. Dishes focusing on salmon and quinoa were the first two to arrive from the kitchen. Four discs of perfectly cooked salmon were rolled in sesame seeds and served pink in the middle, topped with a small heap of salmon roe to add texture alongside paper-thin slices of radish. Along with the quinoa dish, displaying healthy albeit unpretentious cooking at its finest, the bar had been set tremendously high. Alas, a dish of octopus did not fall into this category. It would be unfair to say that the octopus had been overcooked: the poor beast’s tentacles had been grilled with such intensity that they would have been better off arriving at the table pre-chewed. It’s a shame given that the rest of the dish was, in fact, executed very well. A generous helping of Garam Masala managed to elevate a classic celeriac puree to something a little more exciting, working particularly well with the sweet, earthy cubes of roasted butternut squash and the natural sweetness of octopus, had it been cooked properly. Very slight overcooking can sometimes be forgiven, but in this instance even a great white shark would have struggled to chew through the produce. Not given an option as to how the ribeye steak would be cooked, the waitress, unsure before conferring with the kitchen, insisted that it would be served medium-well. “Do you mean medium-rare?” I enquired, only to be assured that she most certainly did not. Though we requested it be cooked medium-rare instead, the beautiful cut of beef was served having also been overcooked and as leathery as the cow’s former hide. Even more odd, however, was the accompanying sauce, ominously similar to HP Brown Sauce that had been sweetened further and reduced to the consistency of treacle. A dish of lamb belly (an unnecessarily pretentious term for Breast of Lamb) showcased a generally under-appreciated, cheaper joint that delivered great excitement when promised alongside a Middle-Eastern combination of flavours such as aubergine, goat’s cheese, pine nuts, tahini and harissa. Arriving cut into strips, although the lamb was cooked very well, similarities to the British post-pint favourite of Doner Kebab were exceedingly difficult to escape. This wasn’t helped by the curiously sweet harissa, acting more like a sweet chilli sauce, rendering the flavours of goat’s cheese, tahini and aubergine practically untraceable. Of course, the dish was comforting, but in the sort of way that inspires feelings of drunken guilt, juxtaposed to those of culinary delight. Dessert featured a rather enjoyable mango, lemongrass and lime panna cotta, and baked mango custard. Although baked, the custard was served cold and arranged into a Kilner jar (another annoying trend). The temperature posed no immediate problems, yet the plate that nested the jar was so hot that the bottom layer of custard had managed to curdle – resembling something that had been festering beneath an attic water tank for the past six years. There’s no lack of promise at 100 Islington, with its menu that reads like any on-trend food enthusiast’s dream. It is a shame, however, that careless cooking managed to prevail and mar some dishes. Had this been avoided, our dinner could have been brilliant, presenting a melange of cleverly concocted small plates from an ingeniously formulated menu of dishes that seem delicious, on paper. 100 Islington can be found at 270 Upper Street, London, N1 2UQ. Previous PostFree Beer in London From This Friday!